Two big earthquakes within a six-month period sorely tested the resolve of the Lyttleton (New Zealand) community. The Port of Christchurch is situated at Lyttleton. Although battered and bruised by the 6.3 magnitude earthquake smashing the town and the Port in 2011, activities to rebuild and expand the Port are progressing with grit and determination. This is a port which handles over 350,000 containers in a year, and growing. A fourth and new ship to shore container crane has been installed, with the very first Genie SX-180 boom lift to arrive in Australasia performing a pivotal function in the construction. The purpose designed and manufactured container crane was manufactured in Ireland. All 1700 sections of the crane were then sent by sea freight to the Lyttleton Port of Christchurch to be erected in situ on the dock. Specialist port services contractor, Rich Rigging, was retained to assemble this monstrous structure. Rich Rigging is an acknowledged expert in the assembly, erection, disassembly, relocation and maintenance of port container cranes. The container crane at Lyttleton, Port of Christchurch, stands 49 m tall to the top of the beam and when complete weighs in at 850 tonnes. According to Murray Rich, MD of Rich Rigging, a tight timetable made this project tougher than normal. “We had a window of only eight weeks to assemble this container crane," said Murray Rich. When working on port container cranes, Rich Rigging had been using smaller boom lifts, enduring the obvious height limitation. In order to get riggers to the full 50 m heights required, a combination of mobile cranes with a man cage had to be used. “We’ve been keenly waiting for the Genie SX-180 boom lift to arrive,” said Murray Rich. Having the Genie SX-180 boom lift on site has delivered an added level of safety. With the ability to reach to the top of the beam on the port container crane, the boom lift has the height to reach workers in the event of an incident. 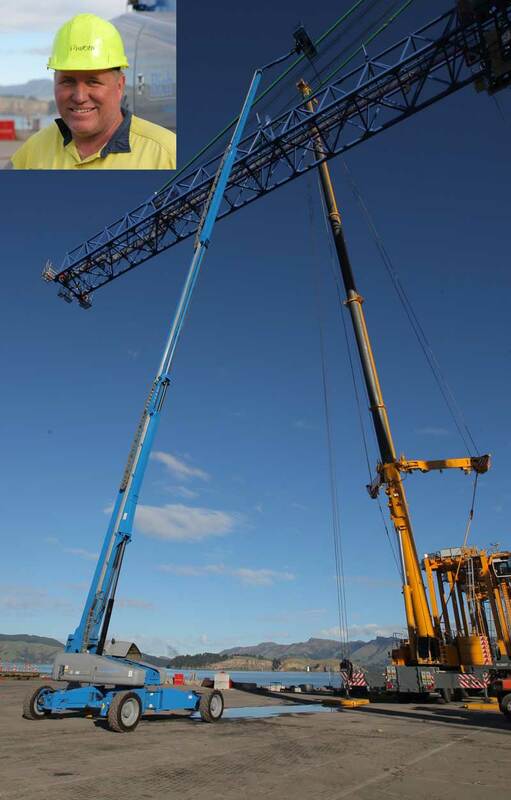 With the container crane erected and now working on the docks at Lyttleton, Murray Rich and his team packed up their equipment ready to move on to the next project. The first Australasian Genie SX-180 boom lift has successfully completed its first job in New Zealand. It is now due to depart New Zealand and head to Sydney where it will reside with Uphire.